NBA Finals Game 7 is scheduled on Thursday, June 17, 2010 9:00 PM ET live from the Staples Center, Los Angeles. This will be aired live telecast by ABC. Game 6 Recap: The Los Angeles Lakers won Game 6 with a blowout 89-67 Tuesday night at Staples Center., to force Game 7 in the 2010 NBA Finals. The Lakers built up a big lead early in the game. It was that type of intensity the Lakers showed from start to finish. Rajon Rondo was cut on the chin compliments of a Ron Artest elbow. Kendrick Perkins had to be helped off the court thanks to a Pau Gasol and Kobe Bryant sandwich. Paul Pierce wound up on his back time and time again in large part because of the Lakers’ swarming defense. Kobe Bryant scored 26 points, Pau Gasol added 17 points and 13 rebounds, and the Lakers held Boston to the second lowest-scoring performance in NBA finals history. Tied at 3-3, the season now culminates in a winner-take-all Game 7 Thursday night June 17th and a champion will surely be crowned at Staples Center. Will it be the Los Angeles Lakers or Boston Celtics? Will this be the 5th ring of Kobe Bryant? or Will this be the 18th title for the Boston Celtics? Let’s find out. If history has any say in the outcome, the Celtics have the edge. They are 4-0 all-time in Game 7’s against the Lakers, who hope to become just the seventh team in NBA history to come from behind to win a championship after facing a 3-2 deficit. You can watch Lakers vs Celtics Game 7 live stream on your cable TVs. There are some cable TV channels that will show the Game live, maybe ESPN, Basketball TV (Philippines), ABC or Solar Sports. 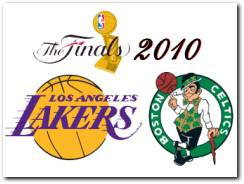 So, come and let’s Watch Los Angeles Lakers vs Boston Celtics Game 7 live 2010 NBA Finals. Watch out for it. Enjoy! For more info about 2010 NBA Finals Live Stream (Schedule), just click the link provided.